As a member of my high school’s track and softball teams, I never had a problem staying fit. In college, I continued to stay in shape by being active in intramural sports. At 130 pounds, I felt strong, fit and happy with my body. Soon after college, however, I started my first teaching job and threw myself into preparing lesson plans and giving 100 percent to my students. Something had to give in my busy schedule and unfortunately, I dedicated less and less time to my workouts. Eventually, I stopped exercising altogether. My weight gain caught up with me a year and a half later when I tried to fit into my favorite pair of shorts. They once fit me perfectly, but when I tried to put them on, I couldn’t even get them buttoned. I stepped on the scale and discovered I had gained 30 pounds. I decided to take off the weight healthfully and to do that, I had to make time to improve my health. I couldn’t let other things in my life take priority. I renewed my gym membership, which I hadn’t used in almost two years, and vowed to get my body moving for at least 30 minutes five times a week. I packed my gym bag each night and kept it in my car so I could go straight to the gym after school. I started off by running on the treadmill and gradually increased my intensity and distance. I also began a weight-training program because I knew building muscle would get my metabolism going and help me lose weight. I tracked my progress in a workout journal and seeing my progress on paper showed me how much I’d improved. After just a couple of weeks, I couldn’t wait to go to the gym to tone and sculpt my body. Slowly, but surely, the pounds started to come off. When I cut late-night snacking and junk food out of my diet, not only did I continue to lose weight, but I had more energy and felt better. I ate more fruits and vegetables, and stopped drinking soda and alcohol, which were empty calories I didn’t need. I discovered healthier cooking methods and learned the importance of eating meals with the correct balance of carbs, protein and even fat. Family and friends complimented me on my progress, which helped remind me of my goals when I felt discouraged. I also used my old shorts to keep me on track with my weight-loss goals. Each week I was a bit closer to having them fit me. Two years later, I reached my goal: the shorts were a perfect fit. Afterward, wanting to keep challenging my mind and body, I signed up for a 10k race. It was extremely tough, but I’ve completed several more races since then because I love every moment of it. 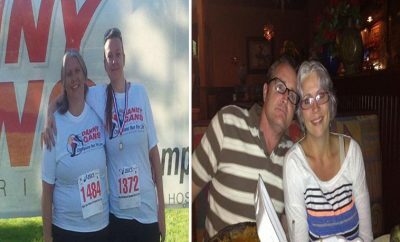 My next goal was to finish a marathon, and after training for six months, I did it. Now I’m working toward becoming a certified personal trainer. I’m proof that healthy weight loss is an attainable goal. I’ve lost 123 pounds…so far.